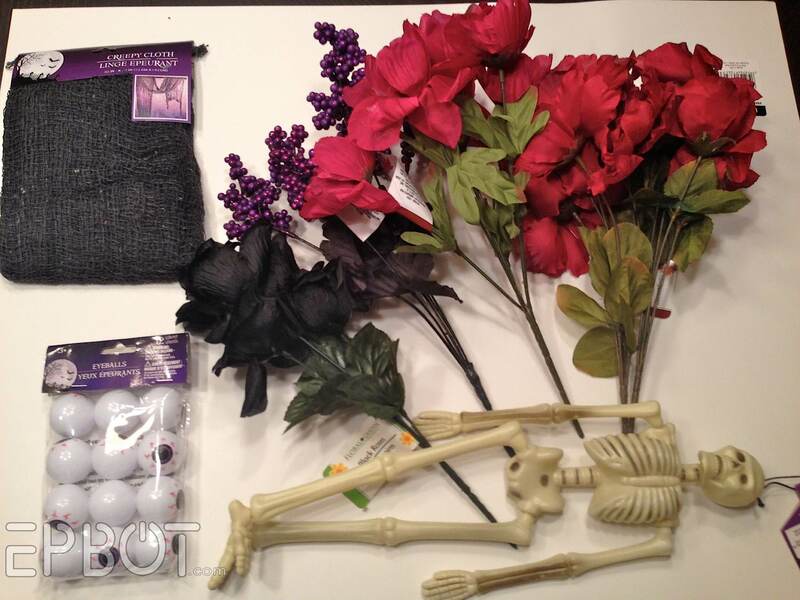 I ended up only needing two flower bouquets, so with the rubber bat (not pictured,) that's $7 in decorations. 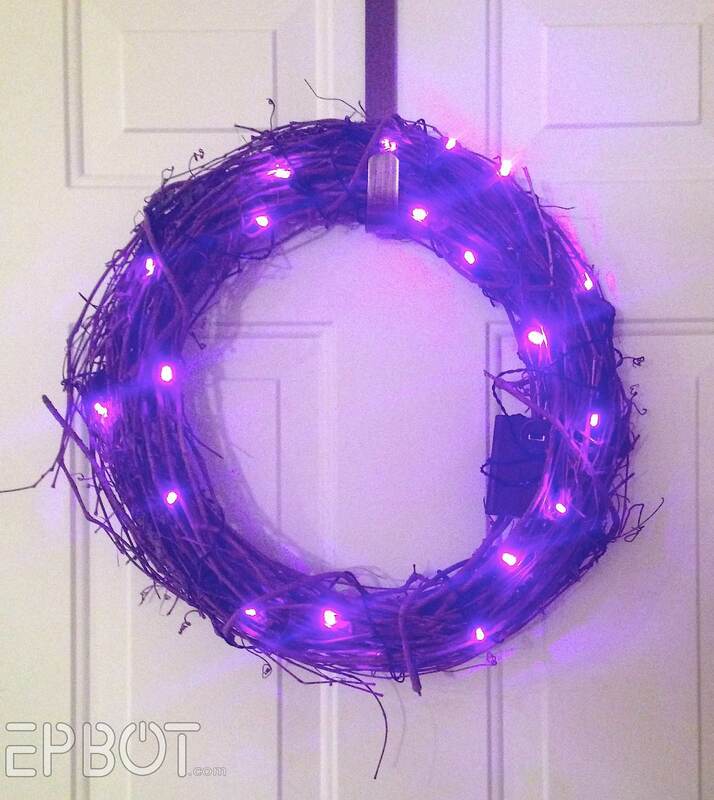 The twig wreath was $2.50 at Joann's with a coupon, and the battery-powered purple lights were another $6 at Walmart. All told, that's just over $15! Wedge the battery pack into the branches of the lower corner, and wind the lights around so they're all facing forward. Yank on the edges and rip small sections here and there, to give it an even more tattered feel. This way is a little more cartoony, so it's better at not traumatizing the little ones. Hot glue the eyes in the center of your flowers (I used both roses and peonies), and you're good to go. It helps to have the lights ON for this stage, so you can avoid covering the bulbs with your flowers. DO hide the battery pack, though. Just make sure you can still reach the on/off switch behind your flowers. 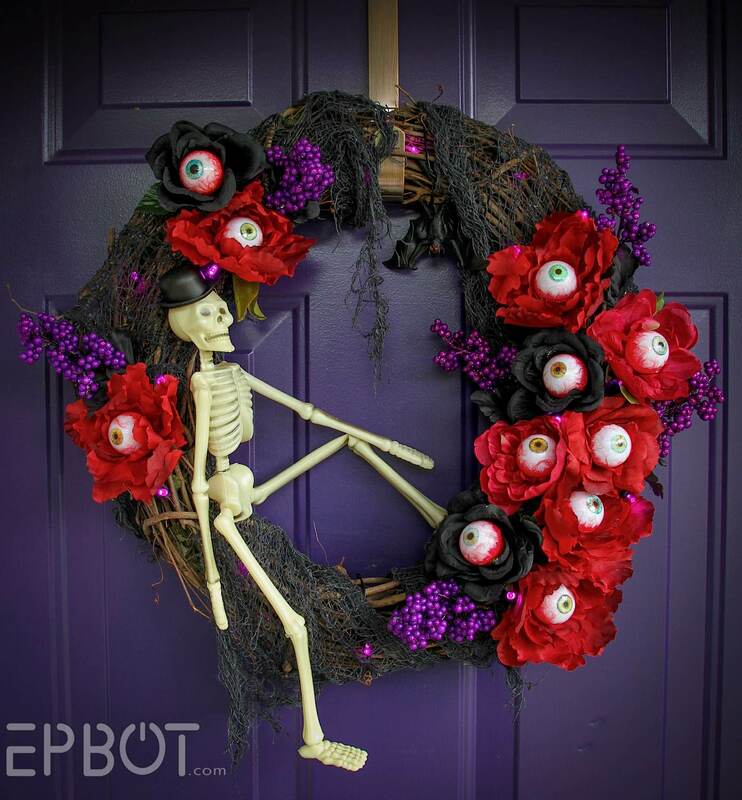 Wedge one foot in to help stabilize him, then hot glue his pelvis and head directly to the wreath. Add a few more flowers or sprigs as needed, and you're done! 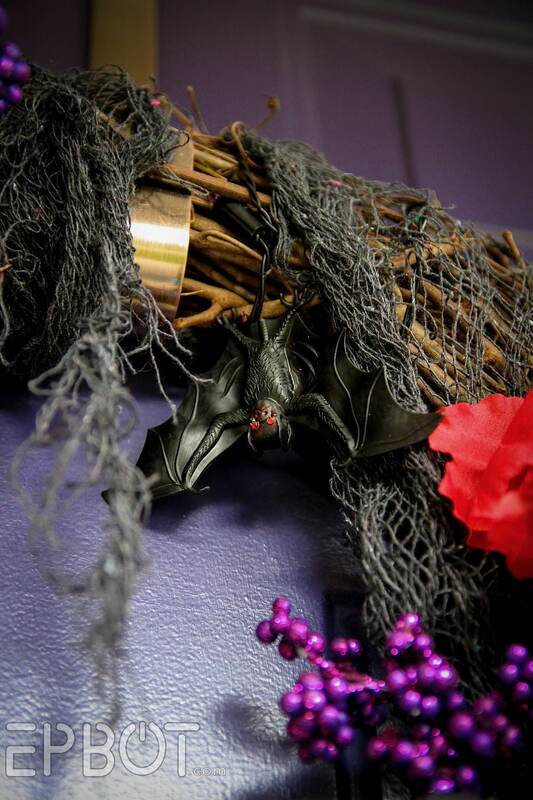 Oh, and the bat was a last minute addition; I just added red nail gems to his eyes for sparkle, then super glued his feet to a branch. 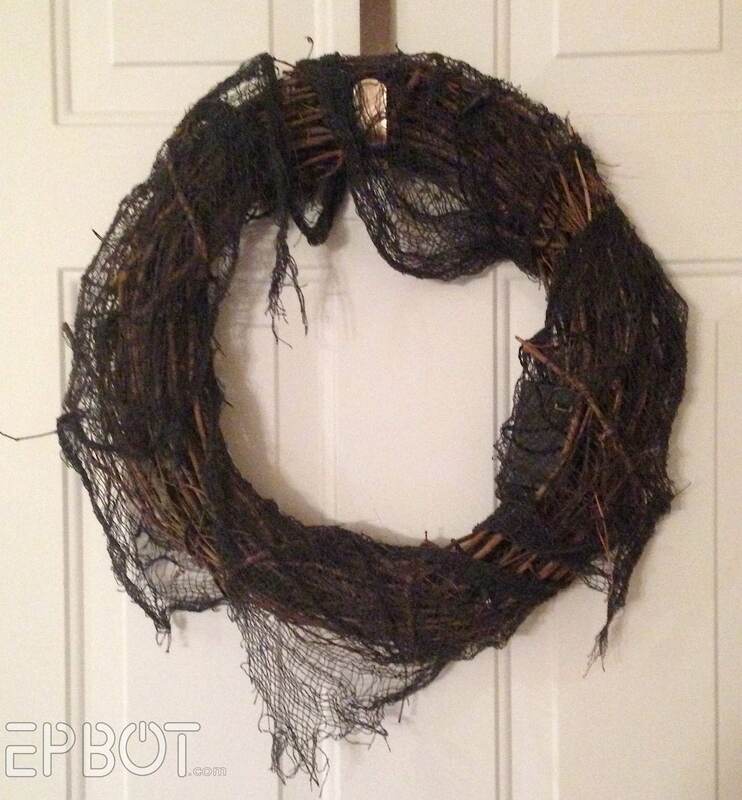 You guys know how much I love orange, but I kind of like having a Halloween wreath with less traditional colors. And the red and purple are pretty dramatic, don't you think? 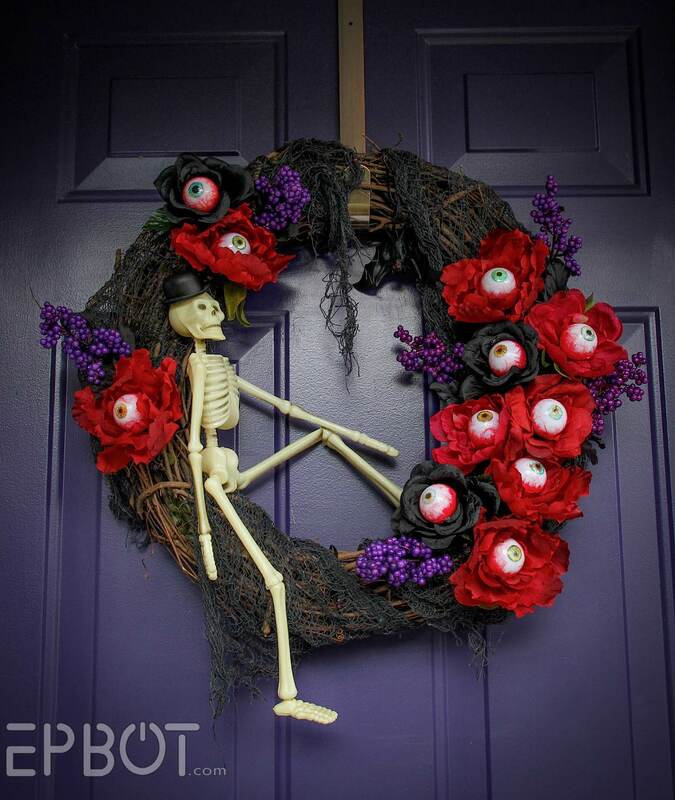 The eyeballs are actually creeping John out, so we'll have to hang this outside soon. Ha! At least it's all weather-proof. Hope you guys enjoyed! And watch this space for that eyeball tutorial, coming soon. I LOVE the eyeball flowers--such a cool idea! I agree with John, those eyes are creeping me out with the little embellishments you made... They kind of remind me of a flower version of those eye creature/plant things in Labyrinth. Love it! A bit too creepy for my kiddos though. I'm thinking of a monster version somehow. Maybe wrapped in brightly colored fake fur, covered in eyeballs and add a set of vampire teeth. Totally stealing your idea and making one for my own door this weekend!! "hot glue his pelvis" !!!!!!! This is UTTERLY elegant, perfectly creepy, and fantastic! Our kids asked for a bit of creepy this year - I will turn them loose with your project and see what they come up with. Thanks!! I LOVE the peeper poppies! THis is awesome! 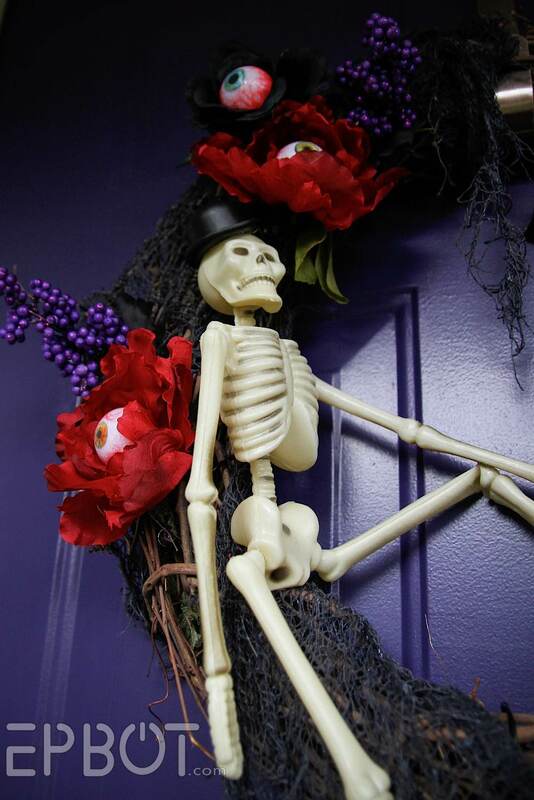 I needed something spooky for my front door. 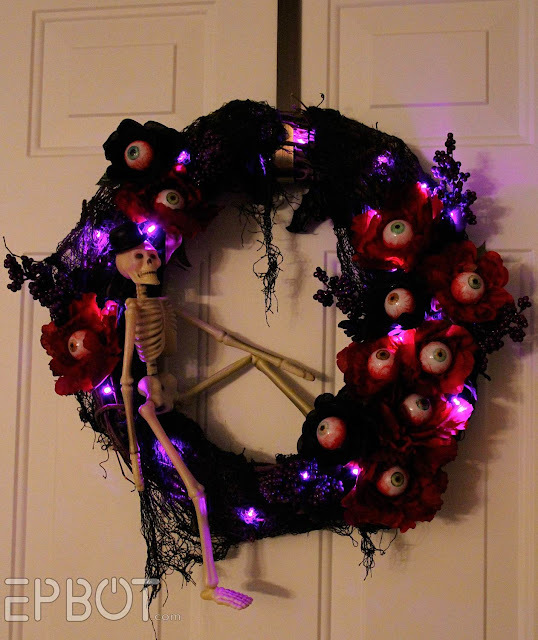 I was thinking about doing something similar, but would probably spray paint the wreath black first. Or a complimenting color... Welp, off to the dollar store! *complementing... I don't want my colors telling me I'm pretty. 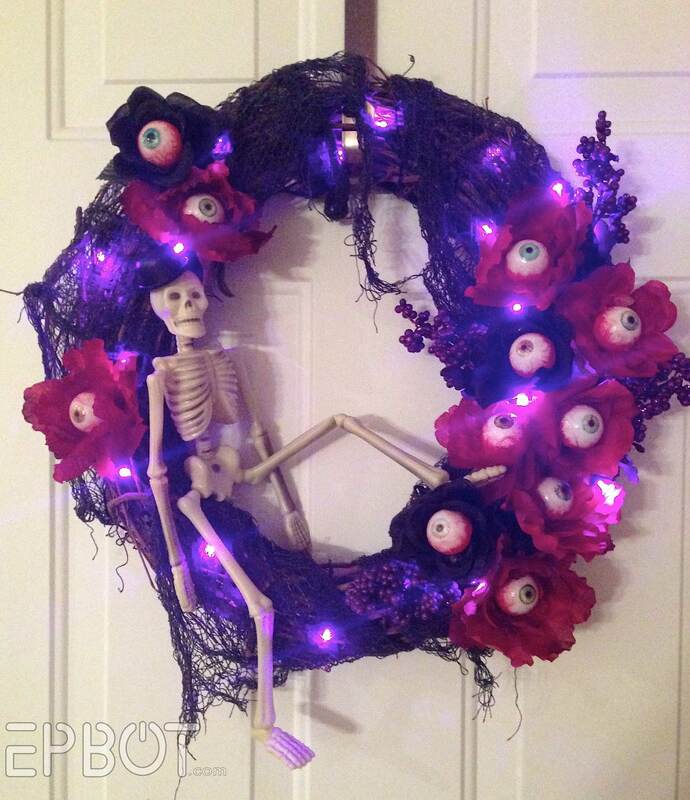 I love how the wreath is so Martha Stewart meets Morticia Adams! I like your eyeballs better, er, the more realistic looking plastic eyeballs that you painted, I mean. I have too many projects going right now (okay, it's only two) to start this. I've got some ideas for a nice Nightmare Before Christmas wreath for December, though. You could also use Ping Pong balls! You might be able to find some in the UK, mad. 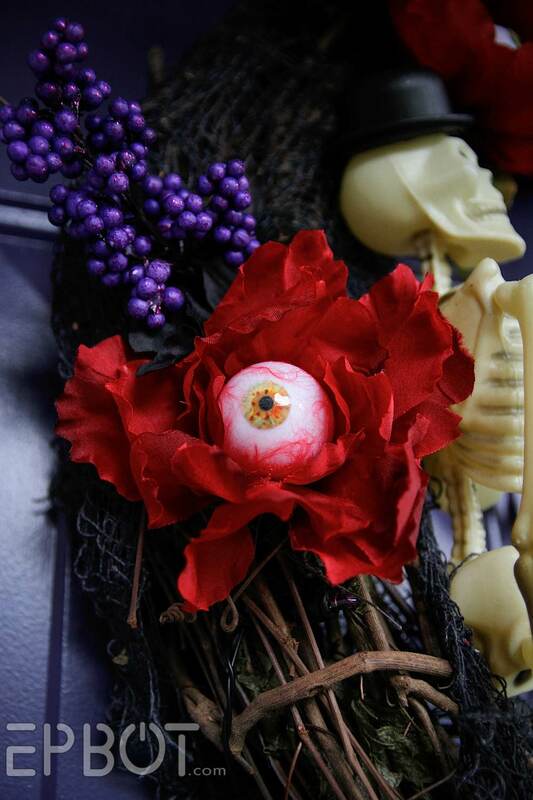 I'm down in New Zealand where Halloween is not a thing at all and I found a pack of the exact same style of eyeballs Jen used in a cheap craft store. Now if I could only find a grapevine wreath down here! Who knew the Halloween struggle was so real? 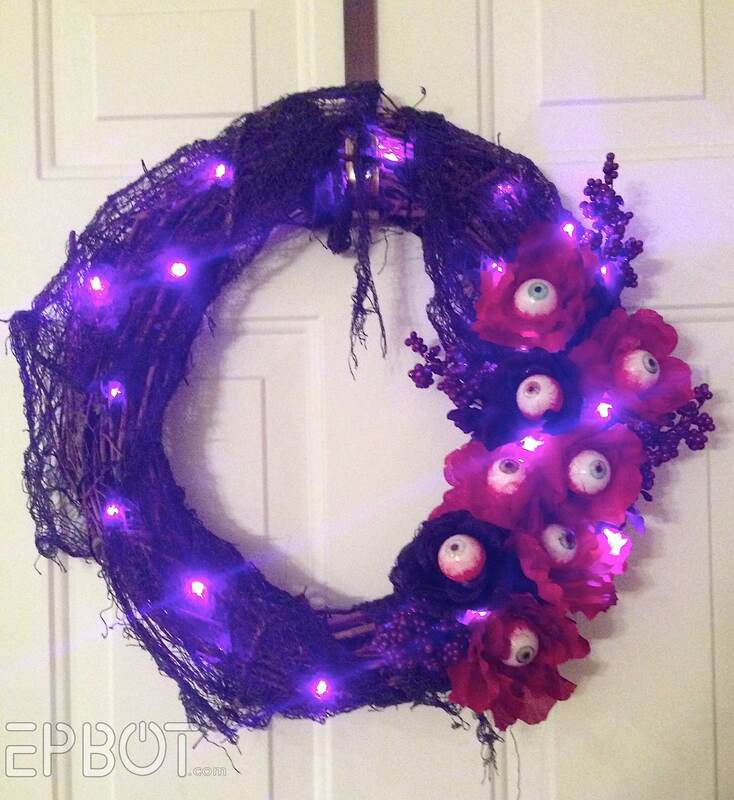 I am in the UK and have just bought a string of battery powered light up eyeballs from lights4fun for my door wreath and they have some rather fabby little bats in Waitrose of all places! I love purple and read and eye balls and top hats! Oh how fun! I was debating grabbing one of those skeletons the other day when I went in for big spiders for our web tent that the kids always love. I will be stalking for that eyeball tutorial as I so need a new eyeball for the goo jar. I need to make this! I just hope I can found some similar supplies around here. Jen, you make such eye-popping creations! You've got monster skillz! That wreath is spooktacular and frightfully delightful! It take guts to make something so creepy, no bones about it! 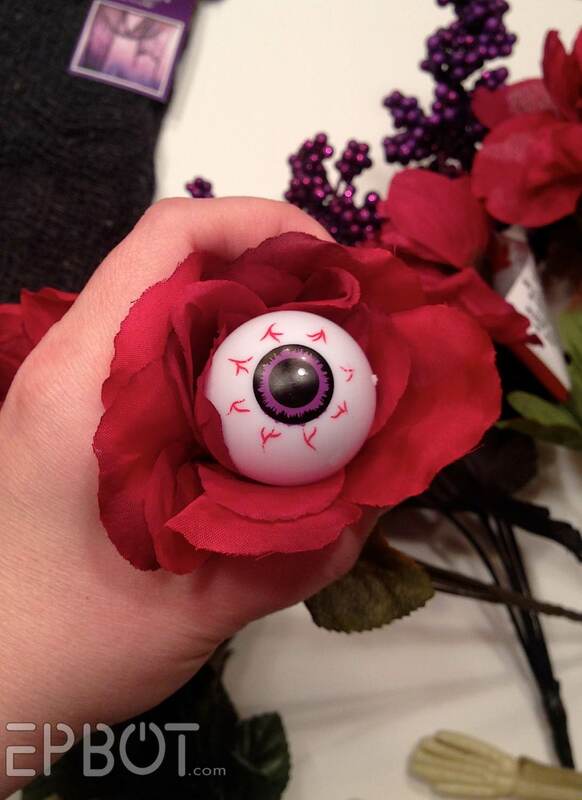 Looking forward to the eyeball bootorial so I can scare the boys and ghouls who will be goblin up my Halloween candy! Thank you for reminding me that I do indeed still have a blue butterfly wreath hanging on my front door. (I am 100% serious.) Time to get out the fall stuff! 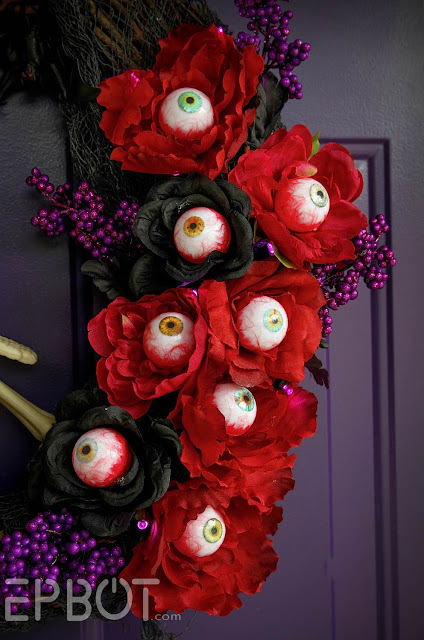 I need bouquets of those eye flowers! Very cute! I totally bought most of these materials to make a similar flower bouquet but now I think I'm going to make a wreath! Can't wait for the eyeball tutorial. I knew I wanted to paint them up as soon as I bought them. Am I the only one tearing my hair out waiting for the eyeball tutorial? I have been obsessing about how, since Jen posted it. I almost just grabbed red felt and started without waiting for the tutorial.... There is probably no red felt involved, but it my mind she uses shredded red felt to get the veins. Ooooo, the anticipation of a mystery solved! "And watch this space for that eyeball tutorial, coming soon." I think...I hope...that that's the first time that's been said! This is very creepy-cool Jen, well done! I've been loving all of these awesome Halloween wreathes everyone has been creating! I wish I was crafty and made fun things like this. I am attending a Halloween inspired wedding later this month. I'm thinking those flowers would make the perfect brooch. Eye love it!!!! Eye am so doing this! 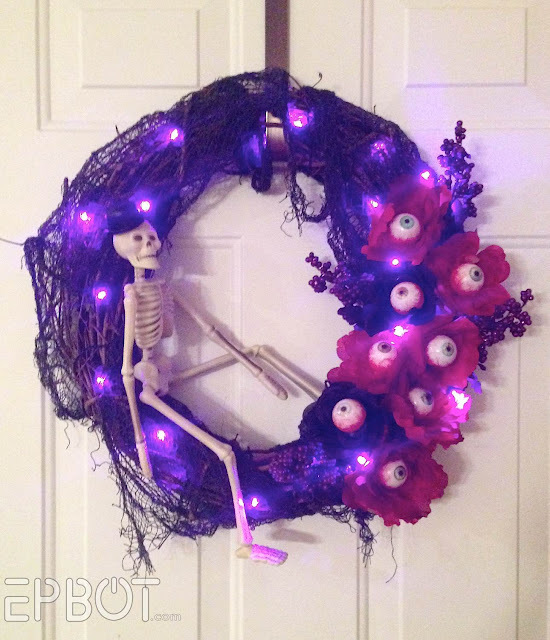 It took forever to finally track down a wreath, but I finally got one! Overall I'm pretty happy with it, but I don't think my eyes turned out nearly as nice as yours. Thanks so much for sharing this project with us!